One of my favorite things about St. Patrick's Day isn't the parties or parades; it's the opportunity to wear the color green. There are so many shades that it's hard to pick when March 17th comes around. From olive to emerald to sea foam, there's no shade of green that I don't like. I even love annoying neon, highlighter green! 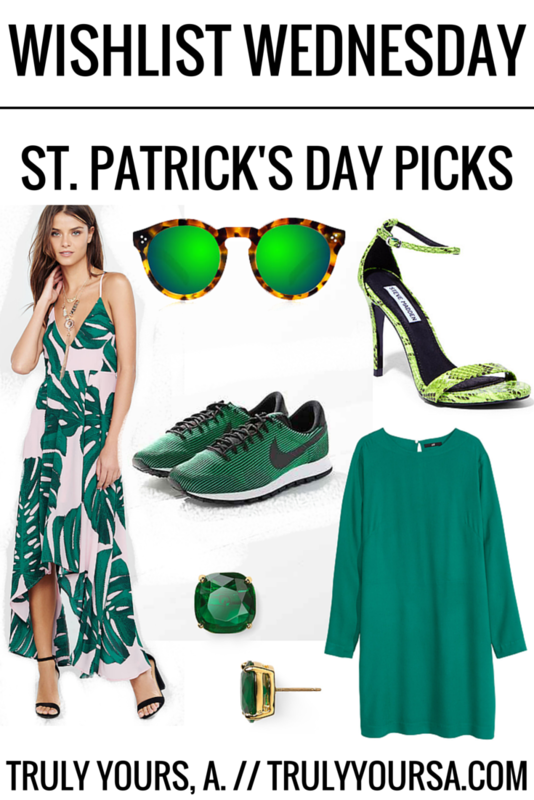 Lucky for you I've compiled a list of my favorite green items that can be worn any time of year. Express Palm Leaf Print Dress // This dress doesn't exactly scream "It's St. Patrick's Day! "; it subtly whispers "Go on a vacation, head to the beach." I might pick up one myself and head off somewhere warm and sunny! Illesteva Leonard II Mirror Sunglasses // These sunglasses would be a super cute way to wear green on St. Patrick's Day and the tortoise shell frames make them wearable any day after as well. 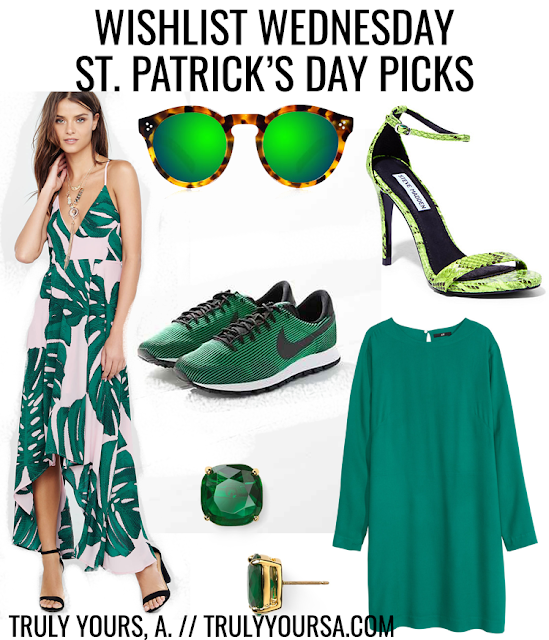 Nike Air Pegasus 83 // These flashy running sneakers are a great way to add St. Patty's Day spirit to your workout routine and they are great for outside of the gym as part of an athleisure outfit. Kate Spade Small Square Stud Earrings // These emerald earrings are so darling and totally wearable any day of the year. They also come in multiple colors so you can be prepared for any holiday! Steve Madden Stecy Sandal // I love snake print. I love obnoxious shades of green so these shoes are a win-win for me. The best part of these sandals - they're on sale! H&M Long-sleeved Dress // This shift dress is a transitional weather staple. It can be worn with flats for a warm spring day or jacket and booties for cooler temps. It's also on sale in the green and navy for only $9.99!